George V crystal powder jar with gilt sterling silver and enamel cover. Made by Adie Brothers in Birmingham in 1930. Bellied with alternating wide and clear facets and stylized floral ornament. 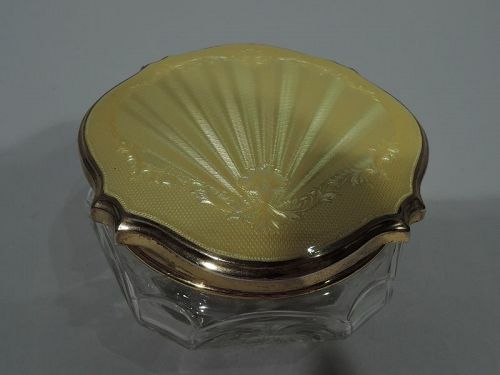 Gilt sterling silver shaped cover has gently curved top with yellow guilloche enamel scallop shell on wavy ground. Fully marked. Very good condition with nice patina and strong color. 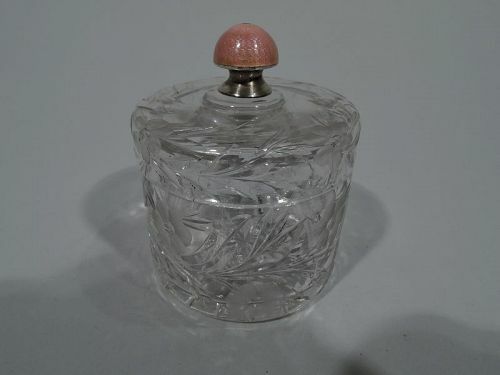 Pretty American crystal covered vanity jar with sterling silver and enamel finial, ca 1900. Drum form with flat cover. Cut and acid-etched floral garlands. Sterling silver and pink guilloche enamel finial. Marked “Sterling”. Very good condition. 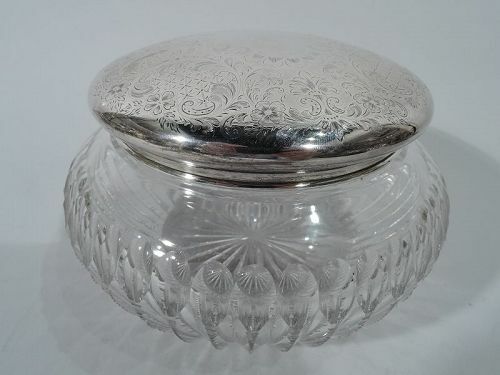 Large Edwardian clear cut-glass vanity jar with sterling silver cover. Bellied bowl with notched flutes and short neck. Star cut to underside. Cover top has central scrolled cartouche (vacant) surrounded by foliate scrolls alternatingly inset with palmettes and diaper ornament. Cover hallmarked Wilcox (a division of International) in Meriden, Conn. Very good condition. 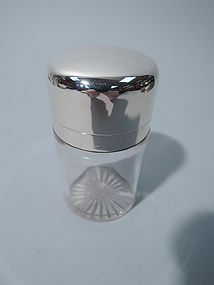 Clear glass vanity jar with sterling silver collar and hinged cover. Made by Gorham in Providence in 1893. Cylindrical with star cut to underside. Cover and rim interior gilt. Interior stopper is also clear glass with short plug. Hallmark includes date symbol and no. S953. Excellent condition. George V clear glass jar with sterling silver and enamel cover. Made by Henry Clifford Davis in Birmingham in 1933. Box is rectangular. 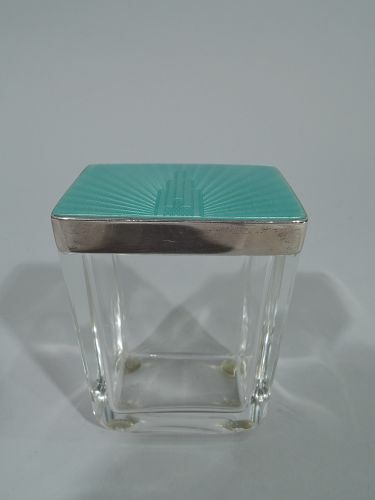 Cover has green guilloche enamel top with skyscraper radiating shaded lines. The cover sides are silver. Smart and modern. Hallmarked. Very good condition.